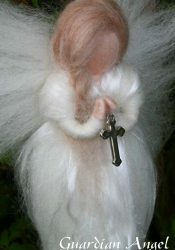 Category: Faeries and Angels. 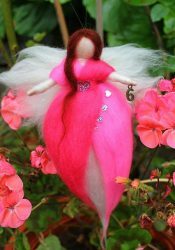 Tags: doll, felting, home, house, needle felted, wool, Angel, decoration, fairy, gift. 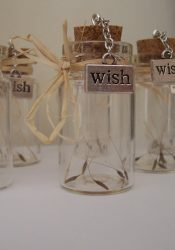 Please note she is already made and therefore we only have one available. Livia has been needle felted in Cornwall with a blend of green dyed sheep’s wool and white silk. Her dress sparkles with silver glitter. A fir cone rests on her dress with silver stars. In her hands she holds onto cones. Livia has curly brown hair and has a star at the side of her hair. She has wispy green blended wool wings. She floats from a clear thread. Please note this is not a toy and should be kept away from young children and babies due to small embellishments. She is a home decoration for inside the house.